This book is the culmination of years’ worth of storytelling. Truly, it is the result of multiple plots nurtured since The New 52’s dawn. Did it satisfy? Yes. Without spoiling too much, the events of Trinity War led to Forever Evil, which means that the Justice Leagues are incapacitated. Save Batman and Catwoman, they are completely out of the picture. So when the Crime Syndicate invades the planet and promptly gains control, there is no one left to challenge them. Or is there? 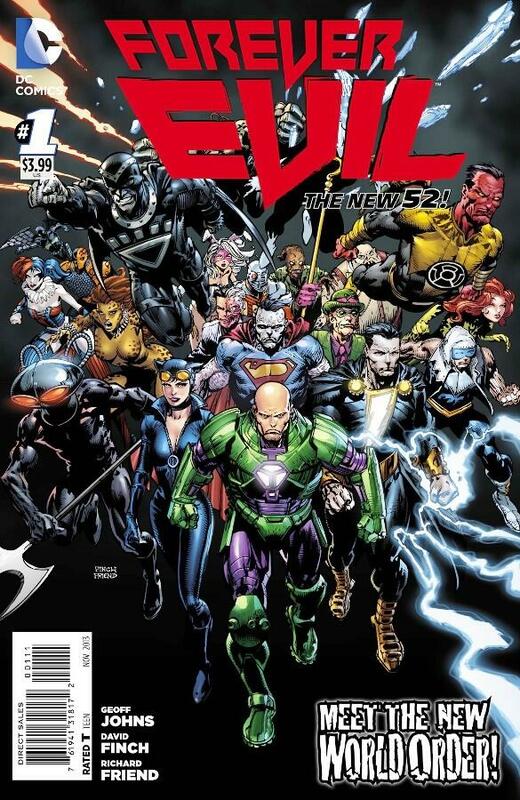 Lex Luthor releases his own personal Superman, recruits Captain Cold, Deathstroke, Black Adam, Sinestro, and Black Manta, and even convinces Batman to join his efforts, and this unlikely band takes on the Crime Syndicate and their Secret Society of Super Villains. I enjoyed this book. I like Johns take on Lex Luthor, and I believe Luthor’s motivation to appear the hero. Johns brought about a renaissance with the Rogues back in the early 2000’s, and his new take on Captain Cold is equally engrossing. Always entertaining, Johns introduced some old favorites to The New 52, and even set about a new direction for several popular characters. I will say this, though. While I always have a great time with Johns, the book felt a little too much like Norman Osborn’s Dark Avengers. Super hero comics are largely derivative, and everything old tends to be new again, but I found it hard to consider anything I read as breaking serous new ground. Of course, I guess one could argue that Luthor was president before Osborn’s ascension to power. At any rate, I’m a DC guy, have been since 1980, and it was a blast seeing new takes on old favorites—especially the Crime Syndicate with the additions of Atomica and Deathstorm. Let’s move on to the art. David Finch is an amazing artist, no doubt. Unfortunately, in my opinion, his work never seems serviced by color. In other words, his pencils are truly astounding, but, after they are colored, his art always looks a little busy to me. However, comic books are a sequential medium, and Finch does well moving the action and story from one panel to the next. I would love to see this book in black and white sometime. Overall, at 240 pages, this book is well worth the money. It resolves several plots and also sets up several more for the future. It gives most of DC’s preeminent villains a moment to shine, and positions Lex Luthor to be more than just Superman’s antagonist. If handled correctly, like with Norman Osborn, this multifaceted bad guy could become one of DC’s most fascinating characters. Geoff Johns gets it. He just does. There’s really nothing else to say, but since this would be a weak review without more exposition, I’ll keep going. In my mind, there’s no truer paradigm of the mainstream superhero than Johns’. If you want proof, read his entire run of The Flash; or, read his work on JSA; OR, simply read his JSA reboot, Justice Society of America: The Next Age. The Next Age picks up right where JSA left off. Most of the fan favorites are still around, as well as some inspired choices for new teammates. Furthermore, Johns has found a new mission statement for the Justice Society of America, one that is trying to teach the new generation of heroes how to be just that. Johns understands the superhero team dynamic. He understands the archetypes necessary for such a team to be charismatic. Johns realizes how to make us care about his characters, how to present edgy–but not gratuitous–stories, and, best of all, Johns comprehends how to manipulate pace, deliver great dialogue, and present captivating foreshadowing. In The Next Age, the Justice Society of America round up some young heroes who may need some positive role models and training, deal with a mysterious entity killing off the bloodlines of other heroes, and are introduced to an element that forces Wildcat to get out of the ring and into the human race. Since monthly comic books are by nature serialized, it also sets up oodles of possibilities for the months to come. Consequently, let’s not forget about artist Dale Eaglesham. I love comic books equally not just for their stories, but also for their art. It’s a visual medium, and Eaglesham renders heroic looking, but not hyperbolic, figures. He chooses gripping angles within his panels, and, like Johns, he seems to have an innate sense of what makes a superhero comic both tense and fun. The hardcover edition of The Next Age even offers some breathtaking pencil sketches from Eaglesham during the design process. We can debate all day as to whether or not Johns is the best writer in the comic book industry, but as far as pure super heroics and team dynamic go, there is no one better, and Justice Society of America: The Next Age is proof positive of that. I’ll admit it, I read every spoiler of this series on a weekly basis. I know how it ends, but even that did not diminish the sheer pleasure I derived in reading 52: Volume I. Reading the collected edition of this series cannot possibly mimic the experience of reading it on a weekly basis, but let me just say that the work most definitely holds up as a collected volume. It progresses smoothly with little to no breaks in consistency, and considering that the men writing it were working as a team and cranking this monster out for an entire year, AND never missed a deadline, well, that just makes me appreciate the work even more. Make no mistake: Volume I is mostly setting up things to come. Even so, I am fascinated with the characters they’re focusing on. They’ve chosen to spotlight characters that are not in the upper echelon of the DC pantheon because, after all, 52 is supposed to take place during a year without Superman, Batman, or Wonder Woman. I love them using lesser-known characters because the reader realizes anything goes, which obviously lifts the level of suspense. But even by the end of Volume I, these lower-tier characters had already won me over. I also need to tell you that while the writing is rock solid, the art changes from issue to issue (as you can surely understand). I found the art more than adequate, but for some people it may be distracting. I truly believe you have to put yourself in the shoes of the creators with this work and keep an open mind on some of the production issues that they had no control over. They pulled off an amazing feat, and best of all, the quality is superb!